BTS’ 2018 “Love Yourself” world tour will be screened at 3,800 cinemas in 95 countries for just one day on Jan. 26. The film documents the August premiere of the ongoing 20-city world tour in Seoul. The Seoul shows, held for two days on Aug. 25-26 at the Seoul Olympic Stadium in the city’s southern district of Songpa-gu, sold out 90,000 tickets. The upcoming film is not the septet’s first concert documentary. “Burn the Stage,” which captures the group’s 2017 “The Wings” concert tour, hit theaters on Nov. 14 to huge success. The film was shown in some 40 countries, drawing an accumulated audience of 1.96 million and recording a high rewatch rate of 10.5 percent, according to the group’s label Big Hit Entertainment. 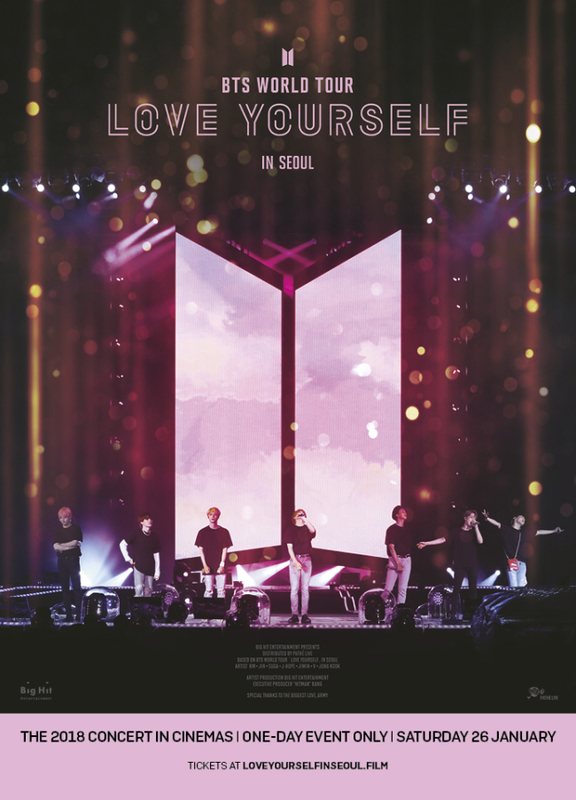 “BTS World Tour Love Yourself in Seoul” distributor Pathe Live, a Paris-based distributor of event cinema, said the “Love Yourself” concert film has set a record as the largest worldwide release ever for event content in cinemas. Ticket booking is available online at loveyourselfinseoul.film.